The Polish love affair with pork has produced an almost infinite array of hams, sausages, and cured meats of every description, which can be grilled, fried, or baked and eaten hot or cold. But a special place in Polish cuisine is nevertheless reserved for pork tenderloin. This, we have found, is the one cut of pork that even people who say they don’t like pork often love. 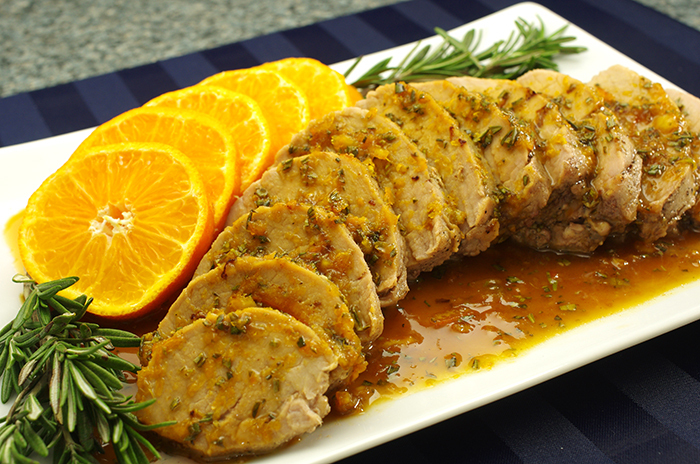 It is soft and tender, and not at all dry, as ordinary pork loin sometimes can be. It is very lean and relatively low in fat. Tenderloin is best cooked with a lot of liquid, as well as something sharp and something sweet. Oranges and rosemary – a fabulous combination, which also appears in one of our flavored vodkas – are just the right thing. 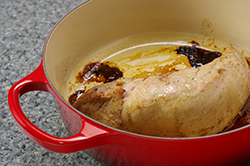 If you have leftover meat, this is excellent cold and the next day, with mustard. Preheat the oven to 350°F/180°C/gas 4. Shake off the marinade and place the meat in a small roasting dish – you can curve it if it is too long to fit – and roast for 40 minutes. 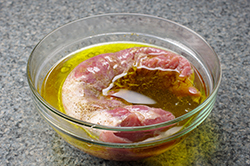 The meat should be white on the outside and very pale pink in the center, and a meat thermometer should register 145°F/63°C. Remove the meat to a carving board and let rest. (Don’t worry if it looks pale. This will be rectified by the sauce.) 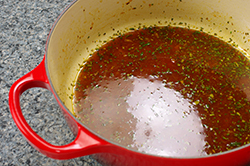 Pour the pan juices into a small saucepan over high heat. Add the orange zest and juice, rosemary, and marmalade. Cook, stirring, until thickened and slightly reduced. 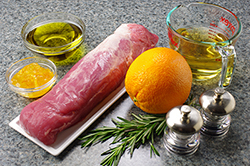 Carve the meat into thin slices and lay them out on a serving platter. Pour the orange-rosemary liquid on top, and serve.